Reimbursement for services is the lifeblood of your organization, which means you need to work smarter not harder. Our RescueNet Billing solution helps identify and address issues that can delay reimbursement, automate the entire payment process including insurance eligibility checks, and prioritize workload for improved productivity so you can drive more revenue. How Does RescueNet Billing Work? Insufficient patient information leads to delayed payment and unnecessary write offs. Non-emergent transports face challenges determining insurance, obtaining prior authorization and identifying patient deductibles. Measuring can positively impact billing processes and productivity. Additionally, Key Performance Indivators (KPIs) initiate triggers for change. With RescueNet Billing solutions, capture more revenue per claim and process clean claims faster so you can get paid on time. 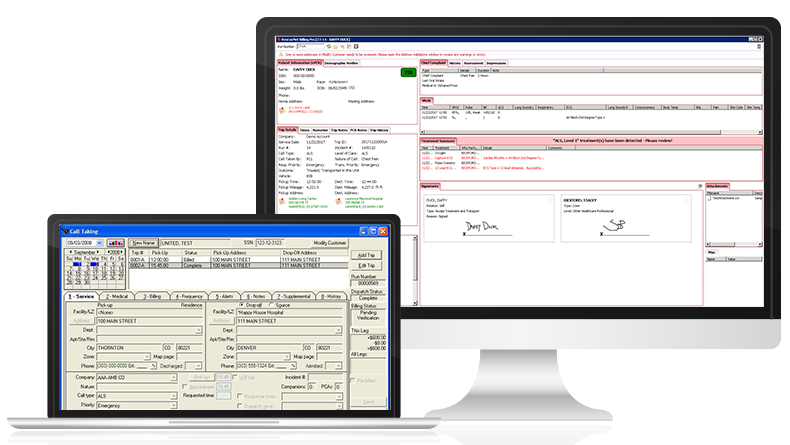 Eliminate duplicate data entry with integration with our Dispatch and ePCR solutions. We’ll help you stay informed and make sure you are ready for changes in guidelines and regulations, such as Medicare, NEMSIS, HIPAA, ICD-10 and 5010, before they happen. Discover complete demographics and billable coverage all at once so you can reduce write-offs and drive more revenue with less effort. "Being able to send claims associated with poor credit directly to collections allows our billers to focus on claims that are more likely to be paid in a timely manner, which ultimately saves us money."